The tablets that Sony has made so far have not made much of an impact on the market, but they might be selling well enough to justify the launch of a new model. And if rumors are to be trusted, that's exactly what the company may working on right now. The Sony SO-03E, also referred to as the Sony Xperia Tablet Z, is said to be an upcoming 10.1-inch Android slate powered by capable hardware enclosed in a watertight body. Do we have your attention already? Okay, then here's what is also rumored about the Sony Xperia Tablet Z: its screen will have a resolution of 1920 by 1200 pixels, and the SoC chosen to provide it with computational power is the quad-core Snapdragon S4 Pro (APQ8064) running at 1.5GHz. The tablet will be LTE-enabled, but we suppose a Wi-Fi-only model will be made as well. You'd also get 2GB of RAM, 32GB of storage, an 8MP main camera, and a 6000mAh battery. As we mentioned above, the Sony Xperia Tablet Z will be resistant to dust and water damage, all the while sporting a thickness of only 6.9 millimeters. Last but not least, Android 4.1 will come out of the box. However, we have to stress that what you just read is nothing but a wild rumor, and the source does not provide any solid evidence to support it. 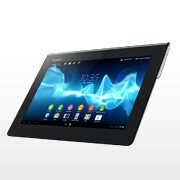 But if the Sony Xperia Tablet Z truly exists, then there's a chance of hearing more about it next month at MWC. Elly Tran Ha or Elly Tran, that is. "resistant to dust and water damage, all the while sporting a thickness of only 6.9 millimeters." that's something to really look froward to! The Xperia Tablet S is made of (mostly) glass and aluminum, just like an iPad, but it is slightly smaller, slightly thinner (cept for the fold) Hold them both and the Xperia reveals how much better built it is than the iPad, I couldnt believe it, but the iPad felt significantly cheaper in comparison. Holy crap I want a tablet for college and I was thinking about buying a asus transformer but then I saw this wow. Yea I need it exactly for that,most of my courses now use online resources and that includes ebooks I have a new macbook but its heavy to carry around. Hey guys what tablet would you recommend thats below 500$ and thats a 10 in also a 2012 model. I have seen you supporting sony products in gsmarena as well. Excellent tab btw. do you see any problem? i love Sony because it is a prestigious brand. i think right now it is the most trusted.